Chichester Festival Theatre has given the West End some glorious productions recently from Sweeney Todd to Singin’ in the Rain. 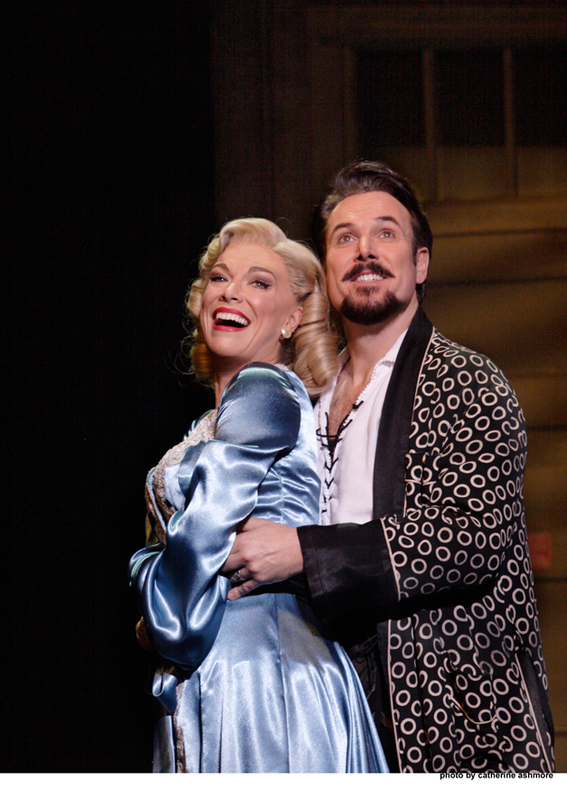 The Old Vic has another Chichester sell out in the Cole Porter classic Kiss Me Kate, direct from its sell-out run at the Chichester Festival comes this hit broadway musical including award winning actors Hannah Waddingham, Alex Bourne, David Burt, Adam Garcia, Clive Rowe and more. Directed by theatre legend Trevor Nunn, it’s a slick show with high production values. 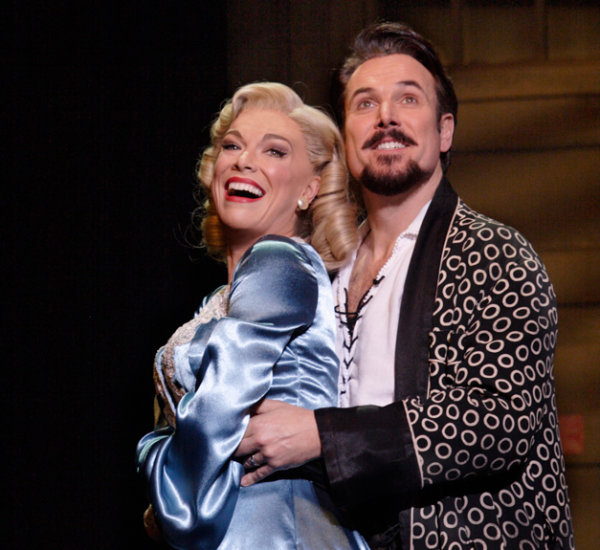 The Story of Kiss me Kate is about an out-of-town try-out of a new musical version of Shakespeare’s The Taming of the Shrew; sparks fly on stage and off as sparring between the co-stars threatens the opening night. 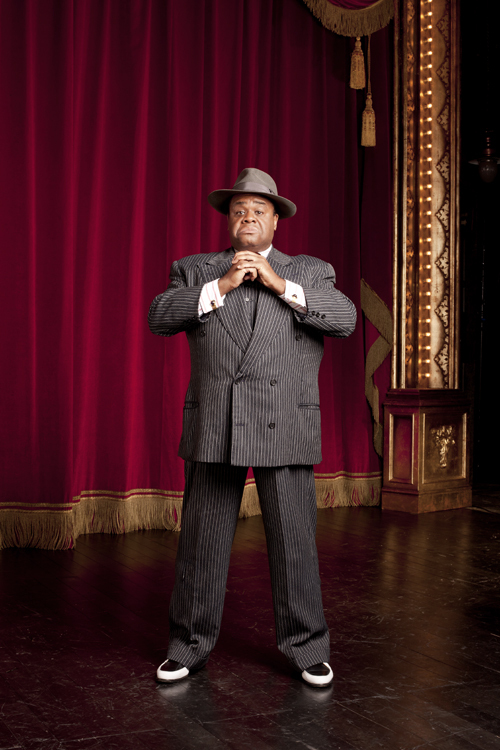 In a classic show-within-a-show, over which loom two gun-toting gangsters (Clive Rowe and David Burt) with gambling debts to collect, Lilli (Hannah Waddingham) and Fred’s (Alex Bourne) romantic shenanigans offstage tangle with the onstage story of Kate and Petruchio as their two worlds dizzyingly collide. These two, famously based on the husband and wife team of Alfred Lunt and Lynne Fontanne, are given terrific star profile by Bourne and Waddingham, the first every bit as dashing and handsome as Howard Keel in the 1953 movie, the second a beautiful blonde diva with the lungs of an operatic beauty and the pout of a monumental minx. Adam Garcia and Holly Dale Spencer are superb as the second couple with a love story, ladies man Bill Calhoun and aspiring Lois Lane. Lois explains her passing flirtation with a military chief and war veteran (Mark Heenehan) in the couple’s delightful duet, “Always True To You In My Fashion.” Garcia is nimble-footed and brings joy to his dance numbers – you may recognise him from being a former Got To Dance judge on our TV screens. Garcia, whose familiar face is on the show poster, has a background in theatre and is an expert tap dancer. Stephen Mear’s choreography bursts with wit and invention, especially during the spectacularly staged Too Darn Hot, which sees the impish hip-swivelling hoofer Jason Pennycooke gliding across the stage while doing the most incredibale splits. Robert Jones’s designs atmospherically evoke a tatty old touring theatre. Frankly, nights at the theatre don’t often come more enjoyable than this – its a real belter of a show and I came out feeling thoroughly entertained and wanting to pop back to see it again. Tickets are available from the Old Vic website or phone the box office on 0844 8717628.